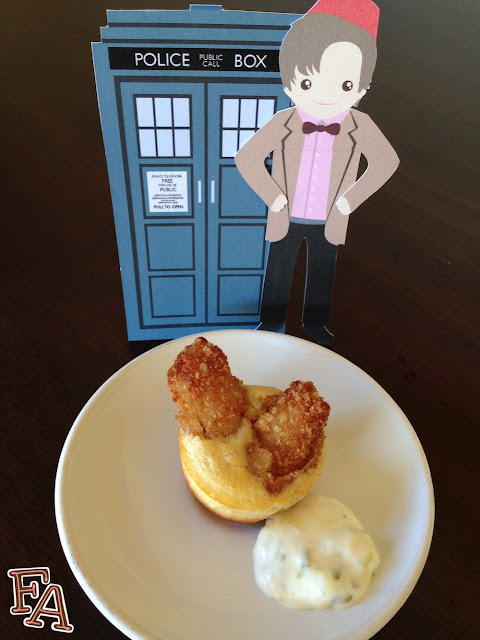 Fiction-Food Café: Fish Finger Yorkies for "Doctor Who"
Fish Finger Yorkies for "Doctor Who"
"Doctor Who" is a well-loved, long running science fantasy show from the BBC celebrating its 50th anniversary this year. 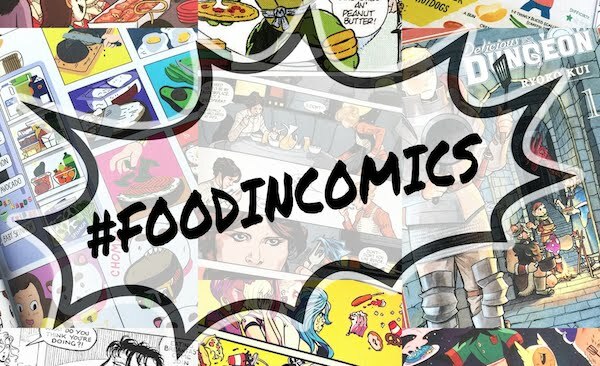 Among the many memorable scenes, scenarios, and aspects of the show one element in particular stands out to fans in their attempt to connect with and celebrate the story: the food. The food in this beloved series, though not plentiful or a focus, more often than not is a symbol of the Doctor's quirkiness in his many regenerations and serves to remind us just how unique and alien he really is. 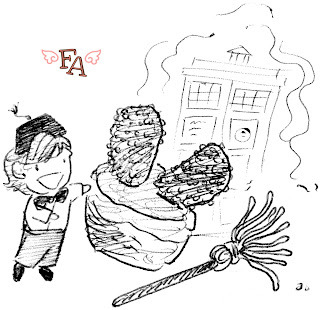 While several of the Doctors have not necessarily liked strange foods, but have liked normal foods strangely (or rather with the fascination/appreciation of a foreigner or child), the most recent Doctor played by Matt Smith, has made an indelible mark on the Who fandom with a very unique dish indeed. 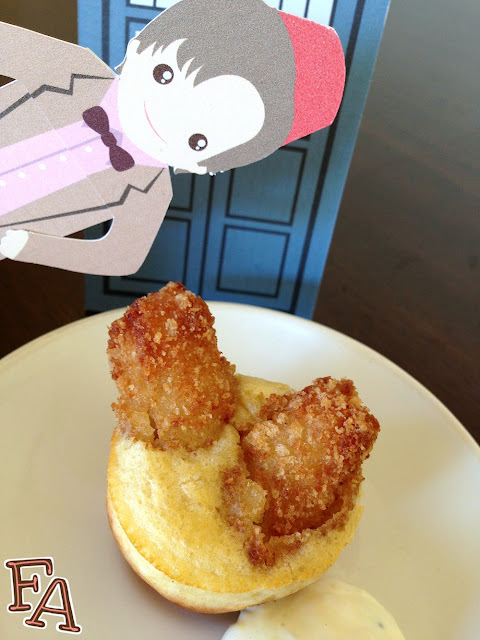 Enter the infamous fish fingers and custard, or "fish custard", from The Eleventh Doctor’s 2010 debut, "The Eleventh Hour" (season 5, episode 1). Whovians were so taken by this unique food pairing that an annual "Fish Fingers & Custard Day" began in 2011 for April 3rd, the anniversary of the 5.1 episode. Though there may exist those who love this dish with both of their hearts, many fans have tried this pairing to either shouts of disgust or shrugs of "meh". I was one of the "meh" crowd in 2011, homemaking the custard/pudding, omitting some sweet in an attempt to make it more savory. Come to find out, even Matt Smith didn't really eat fish fingers and custard in that scene but rather coconut coated cakes in pudding. For the sake of story though it WAS fish fingers/sticks and custard/pudding. Thankfully, in season 7, episode 4 (2012), The Doctor tells us that he is the inventor of Yorkshire pudding, a traditional British side dish (which isn't pudding-y at all, more like a popover). Says he, "Pudding yet savoury. Sound familiar?" Thus rescuing all we fans who would like to be authentic but also wanting something that doesn't offend our sensibilities. Thank goodness. After experimenting with regular size yorkshire puddings + fish sticks (which B, Smalls, and I ate for dinner--really tasty and easy!) 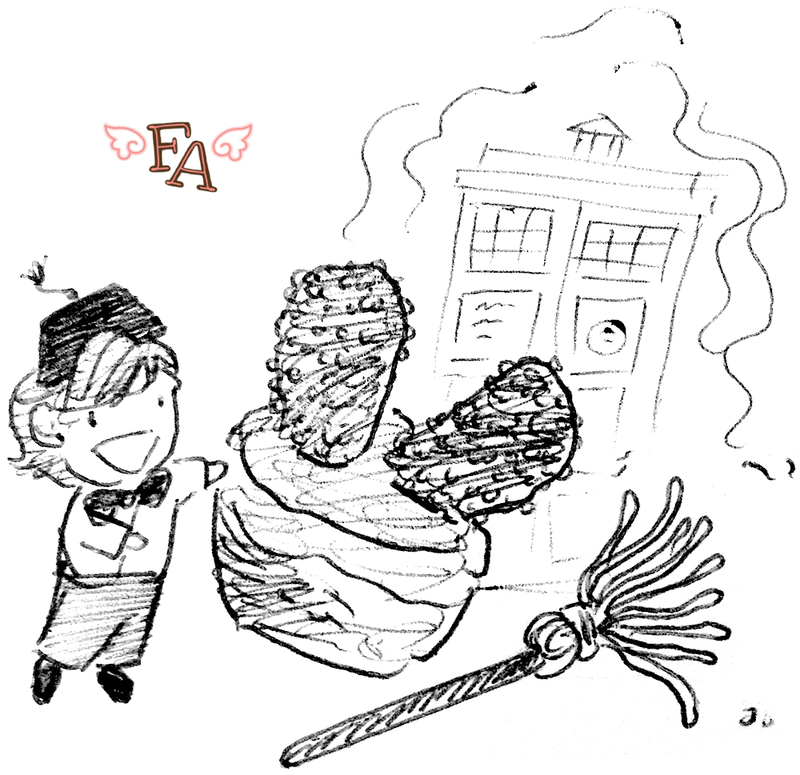 I made the yorkie babies pictured in this post for a small "Doctor Who" get-together. 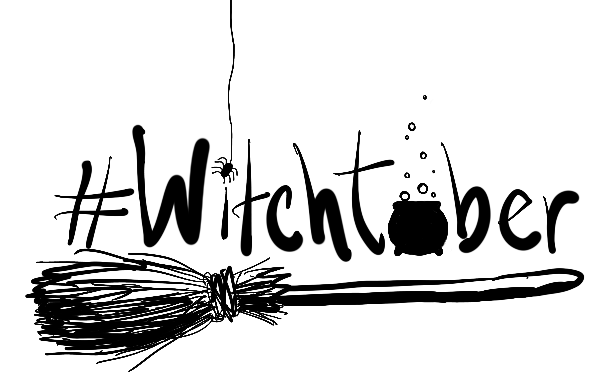 They were a big hit with the grown-ups and wee-ones alike. I also made a simple tarter sauce as a side (recipe farther down). Note: To make larger, regular muffin size fish finger yorkshire puddings, no ingredient changes are necessary. And the big ones are great as the main for a meal! 1. In a medium bowl whisk together the eggs, flour, & milk until smooth. Let rest for about 20 mins. 2. Preheat oven to 425°F. Dice the butter into little cubes & distribute them into the cups of a mini muffin pan. Place the pan into the hot, hot oven for about 5 minutes, or until the butter is completely melted & JUST beginning to smoke. Remove from oven. 3. Pour the batter into the muffin cups (onto the hot melted butter). However many muffin cups are in your mini muffin pan, cut that number of fish sticks in half. 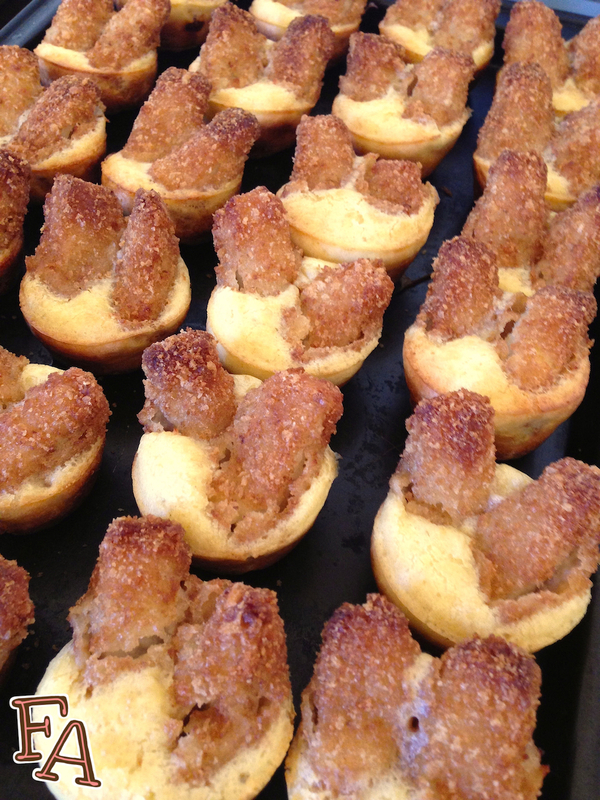 Place 2 halves into the batter in each muffin cup (like little rabbit ears, see photo above). Place the pan in the oven & bake for about 20 min, or until the yorkshire puddings have puffed up & the sides are light-med. brown & the fish sticks are crispy. Whisk 1 cup mayonnaise, 1/2 diced onion, 1 Tbsp. sweet relish, 1 Tbsp. lemon juice, & salt & pepper to taste in a small bowl (add more lemon & relish or less onion if you like). Chill for about an hour or until ready to serve. Serve alongside the fish finger yorkies. The TARDIS & Eleven bookmarks in the photos are from Beth Yates @bethydesigns on Etsy.